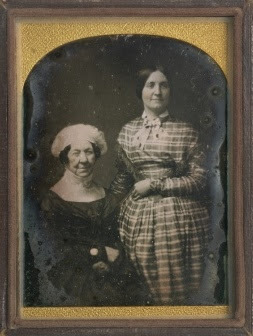 Utilizing rare historic ephemera, the exhibit traces the birth of American Hospitality back to 1775, when Dorothy Quincy married John Hancock and began the tradition of entertaining congress, political financiers, public officials and Continental Army officers at the President’s house in Philadelphia. 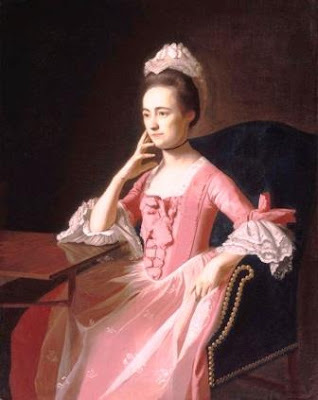 United Colonies of North America (1774-1776) – Articles of Association 1774 printing with important colonial letters and manuscripts featuring Dorothy Quincy Hancock - Wife of Continental Congress President John Hancock. United States of America formed under the laws and resolutions of the Continental Congress (1776-1781) – Declaration of Independence 1776 printing, the 1776 Dunlap Journals of Congress, 1783 printing of the Treaty of Paris & important Continental Congress letters and manuscripts featuring Sarah Livingston Jay – Wife of Continental Congress President John Jay. United States of America under the Articles of Confederation (1781-1789) - Articles of Confederation 1777 Dunlap printing, Decree of Trenton 1782 Manuscript (First Federal Court case that settled Wyoming Valley land dispute between PA and CT), President Elias Boudinot 1783 U.S. Army Mutiny Proclamation forcing the U.S. to move the Seat of Government from Philadelphia to Princeton and important USCA letters and manuscripts featuring Annis Boudinot Stockton – Sister of USCA President Elias Boudinot AND Lady Christina Griffin – Scottish Noblewoman and wife of USCA President Cyrus Griffin. 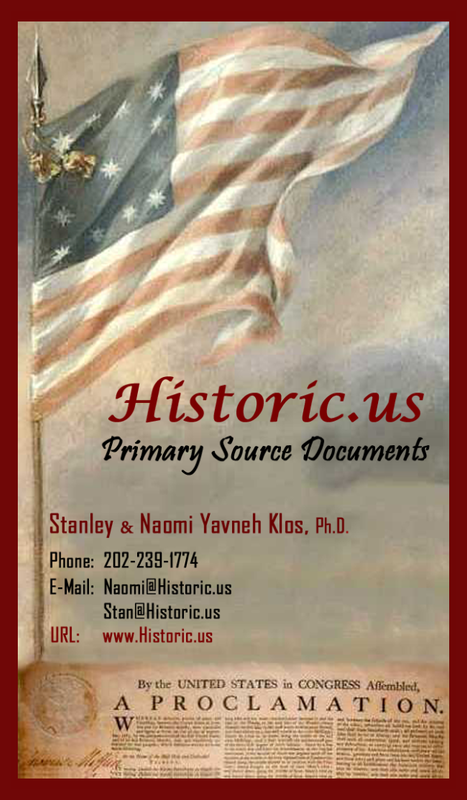 United States of America under the U.S. Constitution (1789-Present) – Acts of Congress 1789: Includes the Constitution and the Bill of Rights, Louisiana Purchase 1803 Congressional printing, Treaty of Ghent 1815 Congressional printing, Treaty of Guadalupe Hidalgo 1848 Congressional printing, U.S. and Russia Treaty for the Purchase of Alaska, 1867 Congressional printing, 19th Amendment original printing, and important U.S. political documents, letters and manuscripts featuring Martha Washington – Dolley Madison - Sarah Polk – Caroline Harrison - Edith Wilson - Eleanor Roosevelt. 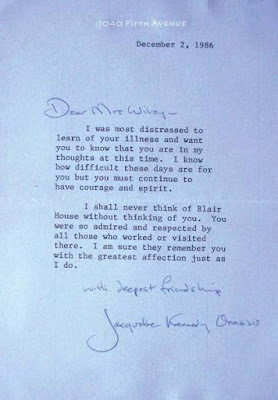 The exhibit also includes the papers of Mary Edith Wilroy, who, as the manager of the Blair House (the President's Guest House) entertained some 225 heads of state. 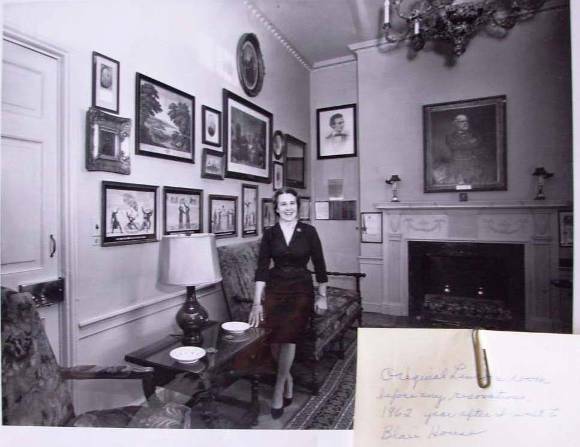 Mary Edith Wilroy began her profession as Blair House Manager on March 2, 1961, only 40 days after John F. Kennedy took the Presidential oath of office. 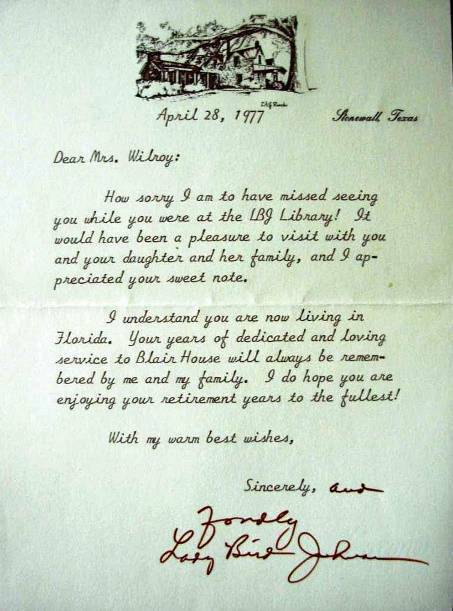 Mrs. Wilroy served her nation in this capacity for 15 years ending her career on July 19, 1975, shortly after hosting Walter Scheel, the President of West Germany. Mary Edith Wilroy on President Truman: "In April, at the invitation of President Johnson, former President Truman was at the Blair House overnight. He had come for the annual Gridiron Club Dinner given by the Washington Press corps. In addition to good food, the dinner always features a song and dance performance that gently and not so gently ribs Washington's famous people. Mr. Truman arrived on Saturday. Our regular butlers were not available, so I hired a butler with the usual security clearance. He couldn't have been a security risk since the poor fellow turned out to be almost totally deaf. Luckily I discovered quickly that he couldn't even hear the front door bell. During the entire visit the parlor maid or I had to be nearby, ready to open the door for any callers. Mr. Truman followed his usual routine, rising early on Sunday morning for one of his famous morning walks. He was accompanied by a small group from the press and was hailed by passersby who were thrilled to see the former President striding by in the manner that had become familiar to everyone all over the country. When he was recognized by people who called, "Hello Mr. President," or "How are you, Harry?" he would stop and shake hands and chat with them for a few minutes. Then he came back, had a leisurely breakfast, and left almost immediately for the trip back to Independence. Since it was a Sunday the front gate was locked as soon as he left, and a small staff was tidying things up inside when all of a sudden the side door bell rang. Because I was in my office I was closest to the door. I went to see who it could possibly be at that time of day on Sunday. I opened the door and there stood President Truman. He had come back to use the bathroom. I showed him the elevator and Rigoberto accompanied him upstairs to the room he had vacated only about a half hour before. 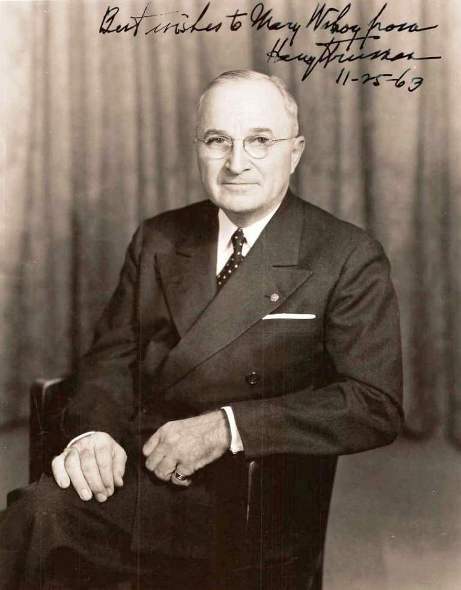 When he came back down, President Truman apologized and said he was sorry to have been "such a nuisance." I, in turn, apologized for the locked front gate. Graciously he said he didn't mind using the side door at all. It saved him from walking up the front steps. But we never again locked the front gate after a departing visitor until we were sure they arrived at the airport." 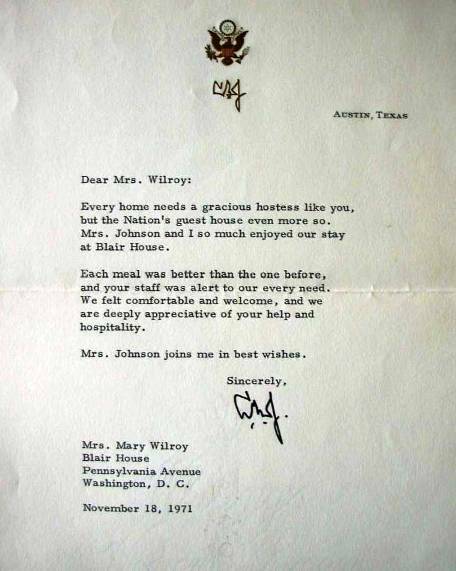 Mary Edith Wilroy on President Johnson: "In February 1964 I was invited to a diplomatic reception. I received hundreds of invitations every year to all sorts of events, and although I was always pleased to have been included I just couldn't go to all of them. I did try to accept White House invitations whenever possible, however, and on this occasion I got to dance with Washington's most sought after dancing partner, the President. The next day the newspapers were calling to ask how I felt about dancing with the President, was he a good dancer, and other weighty questions of that sort. I couldn't really tell them if he was a good dancer or not. The idea of dancing with the President had me dancing on air, I just followed his lead, and before I knew it, the music had ended and I was back at the side talking to Robin. It was really a great treat for me and something I still tell my grandchildren about." Mary Edith Wilroy on Lady Bird Johnson: "Mrs. Johnson, now the First Lady, came for lunch with Robin and several other members of the Fine Arts Committee for a formal tour of the house so that she could see the progress that had been made. 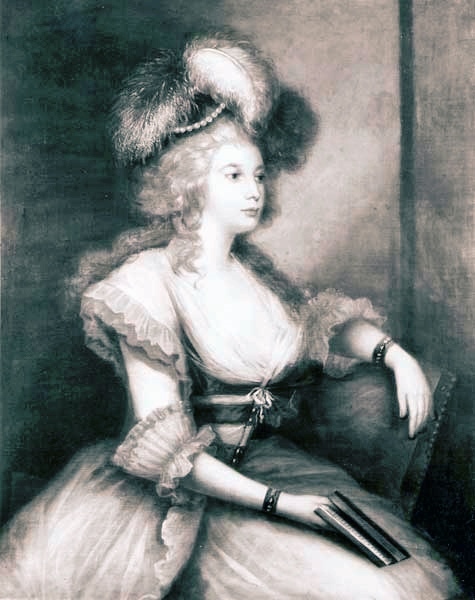 Although she was an enthusiastic honorary chairman of the Fine Arts Committee, she now had so many duties as First Lady that she was unable to do much of the actual work on the committee. She will probably always be better known for what she did to help make America's landscape more beautiful. 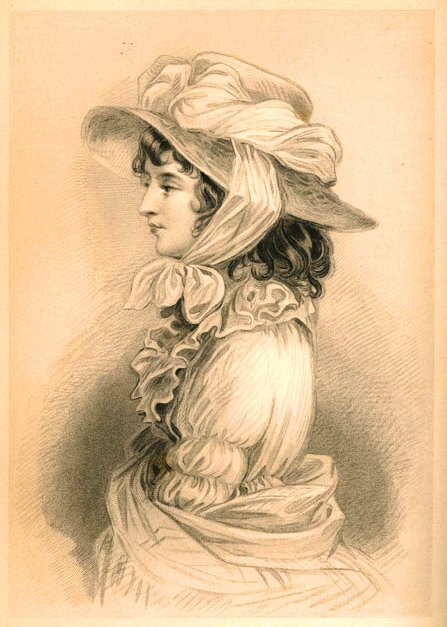 She encouraged people all over the country to plant flowers and clean up neighborhoods. 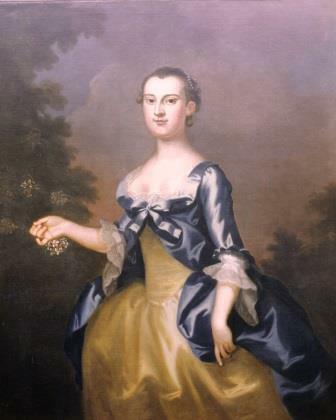 To set an example for such projects elsewhere, she was responsible for many of the lovely plantings of spring flowers that bloom in Washington Parks."